In October 2016, the authors found a remarkable glass slide of Wilbur H. Durborough's World War I feature film On the Firing Line with the Germans (USA, 1915). Advertised as "the greatest scoop of the war", the picture sheds some new light on how war films were promoted in the American theaters during the First World War. Ever since movies were first shown on the screen glass slides were an integral part of the early cinema experience. The first theaters were often equipped with only one projector and films were usually one or two-reelers. While changing films the audience needed to be entertained and because of this slides were projected, displaying lyrics and illustrations of popular songs. By the 1910s theaters also used the "Magic Lantern" to project slides on the screen, showing upcoming films. These slides were often referred to as “lantern” slides because of their origin in pre-cinema magic lantern shows. The glass slide advertising Durborough's film is of a specific type and appears to have been part of a promotional kit that was distributed to exhibitors to advertise his war film. The Durborough film slide consist of two panes of glass held closely together. 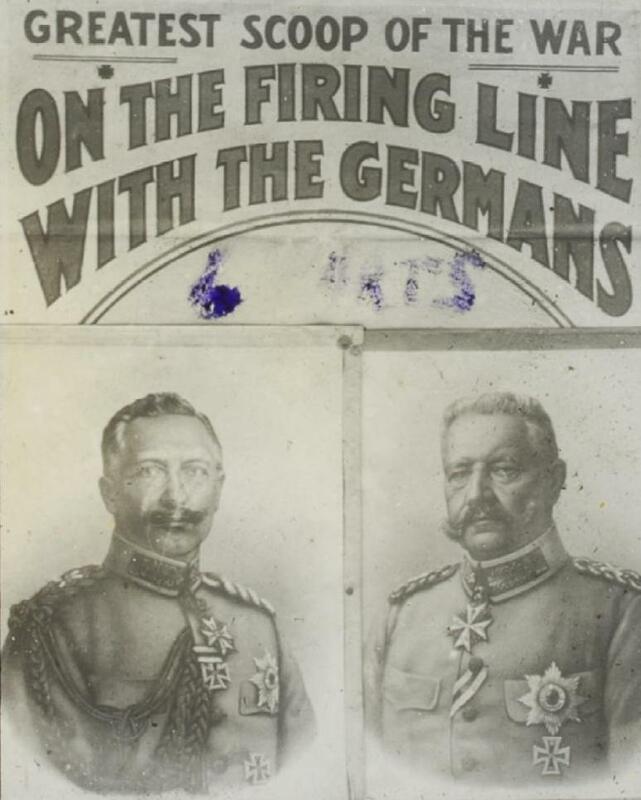 The inside surface of the glass has been imprinted with a positive image of the coming attraction, showing Kaiser Wilhelm II and Field Marshal von Hindenburg. There is a solid black border on both panes on the outside of the image. The two panes measure exactly 3 1/4” by 4”, and they are held together with pieces of black tape on the edges of the two panes. Usually there is a blank border left inside this type of slide for listing local show days. The “black tape” type was mostly made from the earliest silents through the mid-1930s. We found the glass slide on the website of the International Center of Photography (ICP) in New York City and contacted Claartje van Dijk, the assistant curator. The ICP, she said, unfortunately doesn't have any information other than that this is a lantern slide taken by an unidentified photographer. It was donated in 2011 to the International Center of Photography. So, while the provenance of this glass slide remains a mystery, we do get a interesting glimpse how Durborough's film was advertised in the American theaters during World War I. Based on our research Durborough's film On the Firing Line with the Germans (1915) last year has been restored by the Library of Congress and was shown again for the first time since 1917 at the Pordenone Festival of Silent Film in October 2015. The Library of Congress announced the online release of Durborough's restored World War I film in this weblog on November 11, 2016. 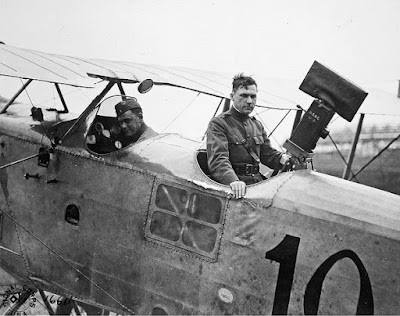 We recently prepared a new, extended story on Durborough's photographic work during World War I. You can read this Durborough Film Annotation here. As a result of the centennial of the First World War, European archives have digitized over 3.000 contemporary films on the Great War on the European Film Gateway. The webportal is a true bonanza for film history fans all over the world. As part of this project, the German Film Institute uploaded a remarkable collection on war front cameraman Wolfgang Filzinger. Born in Dresden in 1889, Filzinger became involved in building the first Pathé movie theatre in Paris in 1911. When war broke out in 1914 he was assigned as a cinematographer for one of the private film companies, presumably Messter, to report on the war. 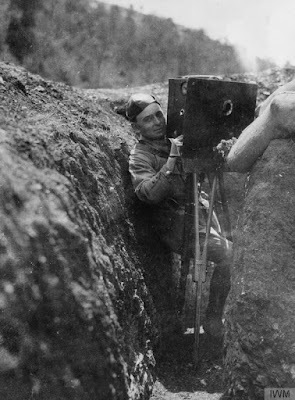 Filzinger left three photo albums that show him and his film team at the western front. He also reported on his film work in the German trade papers. The collection is of great importance to World War I film history. Throughout the war Filzinger cranked an Ernemann-A camera which was built in Dresden. In his photo album there is a picture showing him at the Pontfaverger airfield, France, in March 1915, using a short tripod. This handy tripod came into use a lot, as it allowed filming in recumbent positions which reduced the danger of Filzinger becoming a target. In his articles Filzinger also reported on cloaking devices he invented and employed to shelter himself from both German soldiers staring curiously into the camera, thus destroying the aura of authenticity, as well as enemies spotting him. Other safety measures he employed included a system of mirrors he installed in dug-outs so he could film without risk. There is a sketch by Filzinger showing this cloaking device in his article for Lichtbild-Bühne. "In order to shoot in a trench", he reported, "you have to be familiar with the conditions. It is not easy to find a suitable spot in a trench. It is best to film through an embrasure or from an observation stand. The cranking of the camera is a dangerous business, as it can easily happen that one is hit by shrapnel when shells detonate nearby." Filzinger's images show how the size and weight of the camera and tripods restricted the work of the operator, which is why action often had to be captured from a fixed viewpoint in the distance using a wide angle. This wide angle would also allow operators to capture spectacular events or detonations, as one was always unsure where exactly they would occur. As a consequence the aesthetic quality of such images in terms of composition or depth of field was often mediocre. It is known from his reports that Filzinger tried to improve the visual quality of his footage by working on the diaphragm control of his object lens. After the war Filzinger continued his work in the film sector and is known mostly for conducting early sound film experiments with the Swedish film pioneer Sven Berglund. He died in 1951. Filzinger's original manuscript in German on his experiences filming the Great War can be downloaded and read here. While doing research at the Military Archives in Freiburg, Germany, authors Cooper C. Graham and Ron van Dopperen in February 2016 found a complete list of movie scenes shot by American cinematographer Nelson E. Edwards, showing the German Navy and close ups of Admiral Scheer and von Hipper. The historical footage was taken in June 1916, shortly after the battle of Jutland. A month before our research trip to Freiburg we also identified some of these scenes online. This discovery makes it possible for the first time to reconstruct how Edwards filmed the aftermath of the largest naval battle in World War I and how these scenes were shown in the American and German movie theaters in the summer of 1916. Edwards's film work in wartime Germany has been described in more detail in our book American Cinematographers in the Great War. He ranked among the first, pioneering newsreel cameramen in American film history. From 1914 Edwards filmed for Hearst International News Service and covered the Mexican Revolution. In 1916 he filmed the Turkish and the German side of the World War. He was also chief cameraman for Fox Newsreel during the year of its birth, and thereafter a longtime stringer for Paramount News. When Edwards shot these naval scenes the Germans were in a celebratory mood. They had just fought the battle of Jutland against the British Navy, and although the outcome was indecisive the Germans claimed victory because they had destroyed more enemy ships. To celebrate the event Edwards was invited by the German naval publicity bureau to visit the fleet. The list that we found was cleared on June 29, 1916, by Captain Hans Wittman, a naval publicity officer. Wittman must have been impressed by Edwards' film work because earlier in 1916 he had struck a deal with the German foreign propaganda agency - the Zentralstelle für Auslandsdienst - to use films shot by Edwards of the Turkish army. The list that was cleared by Wittman has a total of 35 movie scenes all showing the German Navy. The footage by Edwards has a length of 1400 feet. 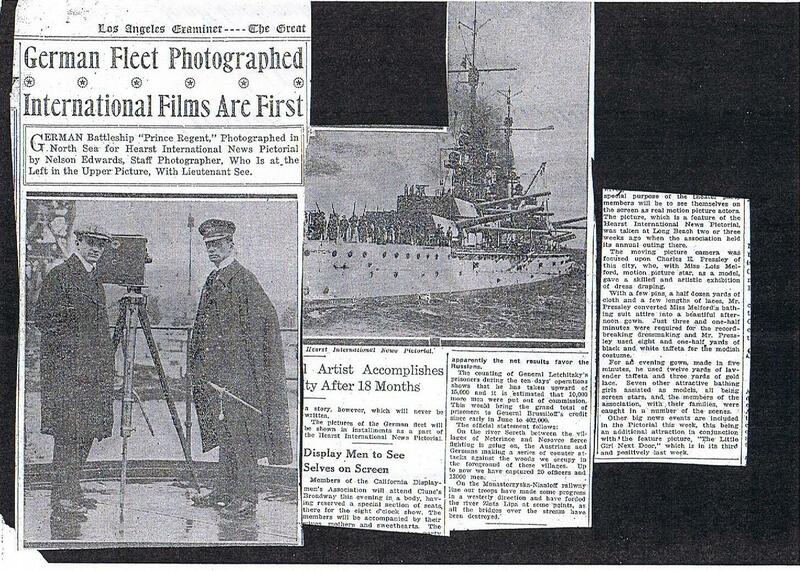 Edwards filmed Admiral Scheer's flagship, as well as the officers of the German Naval High Command, who were proudly posing before his movie camera. In one of the scenes can be seen a young officer, Erich Raeder. He served as Admiral von Hipper's chief of staff in 1916, and during the first part of the Second World War was Hitler's top naval commander. Edwards also filmed numerous battle ships on the high sea. Those listed by name are the battleships Westfalen that destroyed six British torpedo boats, as well as the Kaiser Wilhelm II. He also filmed German torpedo boat destroyers in action, sailors signalling to other ships, excercises on board the German fleet and the daily life of the German sailors. In America Edwards' newsreel films were released in the movie theaters in August 1916. The scenes that we could identify on the list and that were retrieved online are numbers 13, 14, 17 and 18. These show Admiral von Hipper and his staff, as well as Admiral Scheer visiting his flag ship Friedrich der Grosse. The intertitle introducing the scene showing Scheer boarding the ship - a very short flash on film - has a reference to the Hearst International News Pictorial, the company Edwards worked for and further evidence that he shot these scenes. The footage is on 35 mm and the original negatives are from the Grinberg Collection. A print positive was bought for stock purposes by Getty Images. The original footage from Grinberg was also used by the BBC in episode 14 of the Great War series (1964). We have uploaded a research copy of the film clip on our YouTube channel, including the film scenes shot by Edwards that were used by the BBC in the 1960s. The list from the Military Archives in Freiburg, describing the naval scenes taken by Edwards, can be read and downloaded here. From 1916 newsreel cameraman Ariel Varges was attached to the British army. He filmed the operations of the Expeditionary Force at Salonika (Thessaloniki), Greece, and later covered the war in the Middle East and Mesopotamia. Varges previously featured in a chapter on the American cameramen with the Entente in our book American Cinematographers in the Great War. Because of his work with the British during World War I the Imperial War Museum has a remarkable collection of pictures taken by Varges. 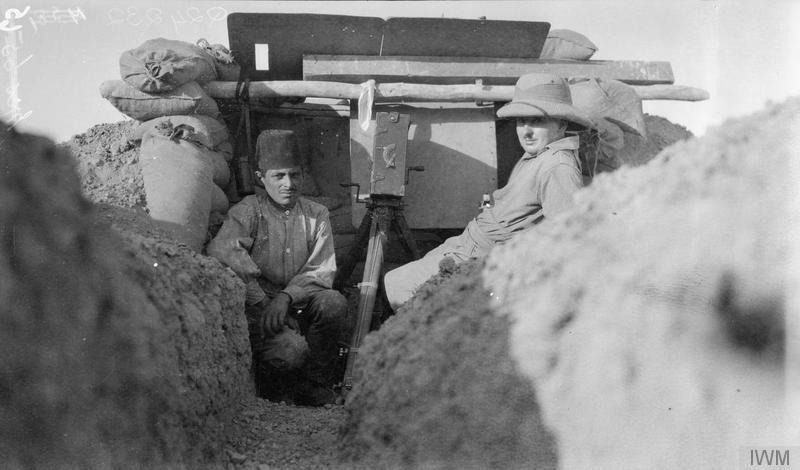 Of special interest are two photographs, showing Varges with his motion picture camera at the frontline. Varges cranked a Moy & Bastie, a model that was first used in 1909 and became very popular in the film industry. In fact, the first regular "Hollywood" film was shot with a Moy & Bastie. Described in their catalogue as 'Simple - Efficient - Reliable', the Moy & Bastie was a professional hand crank 35 mm motion picture camera in the English 'upright style'. The box was constructed from mahogany and had two internal 400 foot film magazines. Focusing was achieved by viewing the image through the film via a tube from the rear. The camera utilized a unique film transport featuring the 'drunken screw' movement to achieve film pull-down. 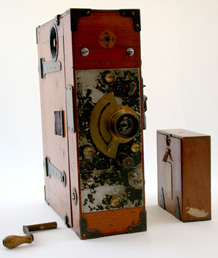 The Moy & Bastie camera was well known for its impressive chain driven movement and brass gear wheels. Varges must have followed army regulations when he used this movie camera because the Moy & Bastie was the official model for cinematographers who were attached to the British army. Malins and McDowell used the same type of camera when they shot The Battle of the Somme (1916). Apart from the information on the type of camera, the two pictures are also interesting because the photographs show the dangers of filming at the firing line. To protect himself Varges used an armour plate that was set up in front of his camera. Varges featured before in this weblog. Here is a link to an earlier story. Also, here is a YouTube video, explaining how the movie camera was operated. A Moy & Bastie film camera which is thought to have been used to shoot the famous Battle of the Somme film from 1916 was on display last year at the Imperial War Museum. The camera is in the collection of the Bill Douglas Cinema Museum at the University of Exeter but was loaned to the Imperial War Museum for their exhibition Real to Reel: A Century of War Movies. The camera is signed inside one of the magazines by the great wartime cameraman J.B McDowell, who filmed some of the combat sequences that make up the film. 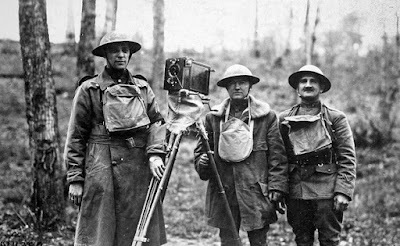 In April 1917, the U.S. Army Signal Corps was designated as the sole official agency responsible for obtaining photographic coverage of America's participation in the Great War. The stated purpose of still and motion-picture film documentation was for use in propaganda and in scientific and military reconnaissance, but it was principally for the production of a pictorial history of the conflict. As described in our book American Cinematographers in the Great War, the expansion of the Signal Corps into the official pictorial coverage of the First World War was slow and painful. The army's main interest in motion pictures was for training and observation. The idea of making suitable pictures at the western front to boost morale in the USA was of secondary interest. Lacking cameramen and the proper equipment it took almost a year before the first motion pictures from France were ready for exhibition in the United States. By the end of July 1917, a laboratory was secured by the Signal Corps in Paris for developing and printing both motion and still pictures. This laboratory served until February 1918, when photographic operations were transferred to a larger location in Vincennes near Paris. Starting with 25 men, the Photographic Section grew in strength to 92 officers and 498 enlisted men by the time of the Armistice in November 1918. An operational photographic unit consisted of one motion-picture cameraman and one still-picture photographer, with an appropriate number of assistants. 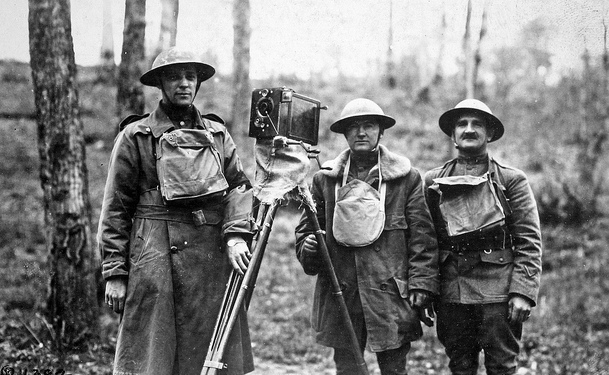 One photographic unit was assigned to each of the American divisions in France. 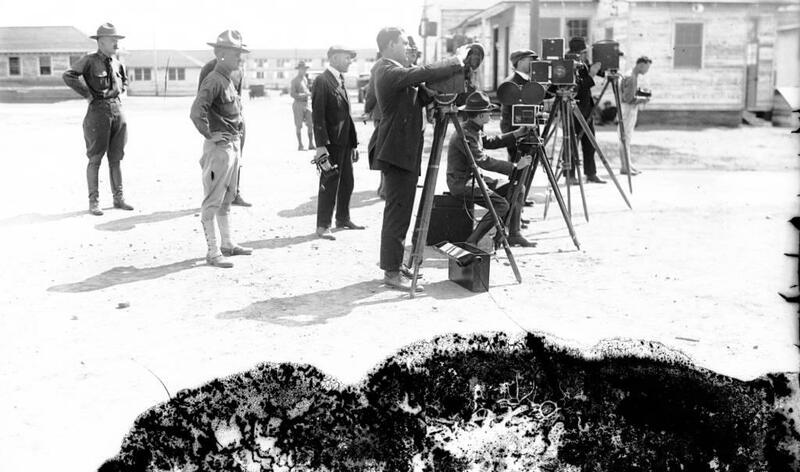 Overall, U.S. Signal Corps cameramen during World War I shot roughly 590,000 feet of film. Phillip Steward for his book Battlefilm did an extensive inventory of these official films which are now at the National Archives in Washington, DC. He listed 993 reels and 488 film titles. In 1936-1937 these films had been culled and re-edited by the Army to combine them into a single subject basis series. The result was the "Historical" series of World War I Signal Corps films with catalog numbers between H-1100 and H-1558. 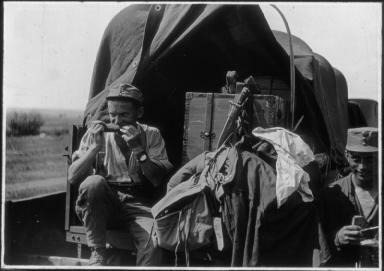 Steward recently added more World War I Signal Corps film to this inventory. In April 2018, he published an article on these films, celebrating the World War I "movie men". His article was printed in the U.S. National Archives' "Prologue" magazine. Here is a download link. Despite the enormous amount of film footage in the Signal Corps collection, there is little film showing the actual photographic work by the Signal Corps in World War I. The authors however did find two reels which are of special interest. Printed on 35 mm and running 1333 feet, the footage shows Signal Corps cameramen at work, the operations at the Signal Corps photographic laboratory as well as various inspections, parades and close ups of the men behind these war pictures. In February 1919, the Signal Corps decided to produce an historical record of their own photographic work in France. For this reason a motion picture cameraman and a still photographer were assigned to record these scenes. Here are the production notes of this film that we found at the National Archives, including a description of all scenes. A selection of scenes from these films, as well as the corresponding still photographs, has been uploaded on our YouTube channel. We added contemporary World War I music to this clip. The most succesful official war film released by the American government during World War I, America's Answer (1918), now is an odd relic from the past. Watching this movie after almost one hundred years feels strange. As Kevin Brownlow noted in his book The War, the West and the Wilderness: "Amused by the titles, intrigued by the antiquity of the equipment, a modern audience can sense none of the manipulative power that the film once had." America's Answer was released in November 1918 by the Commitee on Public Information (CPI), America's wartime propaganda agency. The movie was distributed by the World Film Corporation in 34 cities and grossed over $135,000. The footage was shot by military cameramen of the U.S. Signal Corps. An intriguing story about America's Answer has never been told before: the movie was first shown in France, not in the U.S.A. It was first exhibited at the Gaumont Palace in Paris on June 26, 1918, to a a special audience including Field Marshal Joffre as well as the British and American ambassador. The man who was very much instrumental in producing this movie also hasn't been mentioned before: Edward B. Hatrick, head of Hearst's I.N.S. photo and newsreel service. In April 1918, the CPI sent Hatrick to France to report on the motion picture coverage of the war by the U.S. Signal Corps. His film work in France has been described in more detail in our book American Cinematographers in the Great War. While working on this assignment Hatrick also supervised principal photography for America's Answer. Here is Hatrick's own story about making this movie, as published in the trade paper Moving Picture World of August 17, 1918 and in the Washington News, September 1918. Footage from America's Answer is hard to find on the Internet. The Imperial War Museum has four reels of a British version online, and although a good copy it isn't the complete movie as shown on the screen in 1918. The authors found an original print in the files of the National Archives in College Park, MD, and we uploaded all nine reels of this historic movie on America's involvement in World War I. After almost one hundred years the film is now in the public domain and available to all on the Internet. As far as pictorial publicity is concerned, compared to other belligerents the Austro-Hungarian Monarchy during World War I was remarkably well advanced. As early as July 28, 1914, a military press office was set up - the k.u.k. Kriegspressequartier - which even admitted women to the front as official war artists. As described in our latest book, American cinematographers Albert Dawson, Frank Kleinschmidt and Edwin Weigle wouldn't have been able to make their war films without the assistance of this press office. 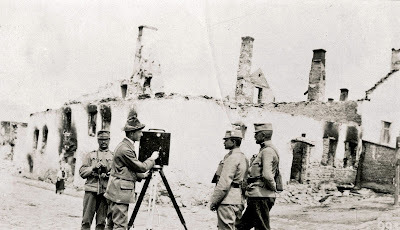 As embedded camera reporters they accompanied the Austro-Hungarian army on the eastern front, in the Balkans and at the Isonzo front where from 1915 the Italian army tried to break through the Alpine mountain passes. To commemorate the Great War the Austrian TV network ORF2 in September 2014 broadcasted a documentary on the k.u.k. Kriegspressequartier, featuring the work by two Austrian cameramen, Alexander Exax and Franz Pachleitner. Exax's pictures were discovered by photo historian Anton Holzer in the archives of the Austrian National Archives. Exax was just 18 when he joined the army and the youngest war photographer at the press office at that time. In his diary he described his experiences in Galicia, Serbia and on the Isonzo front. The Austrian TV documentary shows how his pictures were identified at the Austrian National Archives which still has over 33.000 photographs produced by the military press office. Franz Pachleitner from 1914 pioneered in aerial photography. At the outbreak of war he was assigned to Fliegerkompanie Nr. 10 at Graz-Thalerhof Airport. Most of his pictures were taken at the eastern front in Galicia and the Carpathian mountains. In 1916 Pachleitner taught aerial photography at the military academy in Vienna and from 1917 he covered the war against the Italian army. Despite strict censorship he smuggled most of his war pictures back to Austria, which were kept in the family archives. Shortly before his death he had his war memoirs Kaiser, Krieg und Kamera written down by his granddaughter, Carina Klemmer. 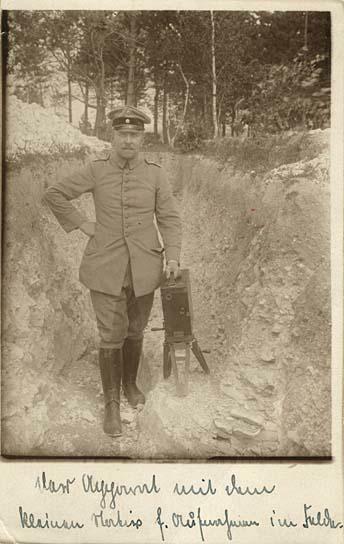 Pachleitner's war pictures have been uploaded on the Internet by the Austrian National Archives and can be viewed here. His book can be ordered here. Here is a video showing the work by these official cameramen from the Austro-Hungarian military press office of World War I, edited from the ORF2 documentary. In September 1914, Edwin F. Weigle - staff photographer of the Chicago Tribune - went to Belgium to film the invasion of this country by the German Army. Weigle was the Tribune's star cameraman who had just before the outbreak of the Great War filmed the U.S. Marines attack on Vera Cruz, Mexico. 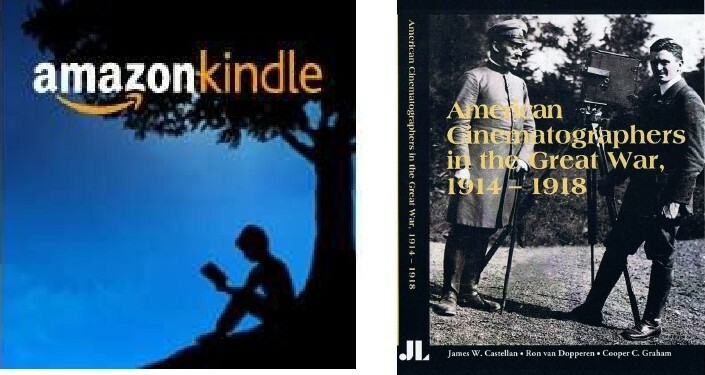 Weigle's war films have been described in more detail in our book American Cinematographers in the Great War. He wrote a personal account on his film work in Europe, My Experiences on the Belgian Battlefields, that was published in late 1914 shortly after Weigle had returned to the United States. In this book Weigle related how he managed to get access to the firing line in Belgium, filmed the German siege of Antwerp in October 1914 and survived the artillery attack on Antwerp in an underground basement together with some fellow American war correspondents. Weigle's account relates an exciting story. It also provides an interesting case story on how neutral correspondents back in 1914 at the start of World War I covered the military conflict with their movie camera. Weigle's film was released in America in November 1914 under the title On Belgian Battlefields. It opened at the elegant Studebaker Theatre in Chicago and was a huge success. The movie was released when public sentiments in the United States on Belgium's fate were running high. 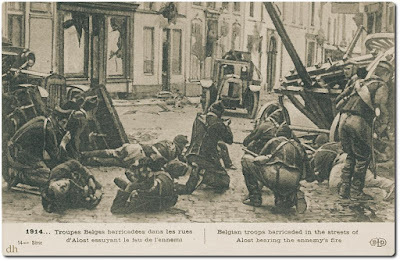 The country had been brutally overrun by the Germans, and there was a lot of sympathy for the suffering of the Belgian people. Weigle's film as well as his personal story also is of special interest because of the 'authentic touch'. Although Weigle worked for a pro-German newspaper and didn't mention any atrocities committed by the German Army in Belgium, his book does provide us with a rare opportunity to witness the Great War as seen through the lens of an American film correspondent. Weigle's 60 page book on his experiences in Belgium is hard to locate nowadays. But we found an original 1914 edition and uploaded the book on this weblog. 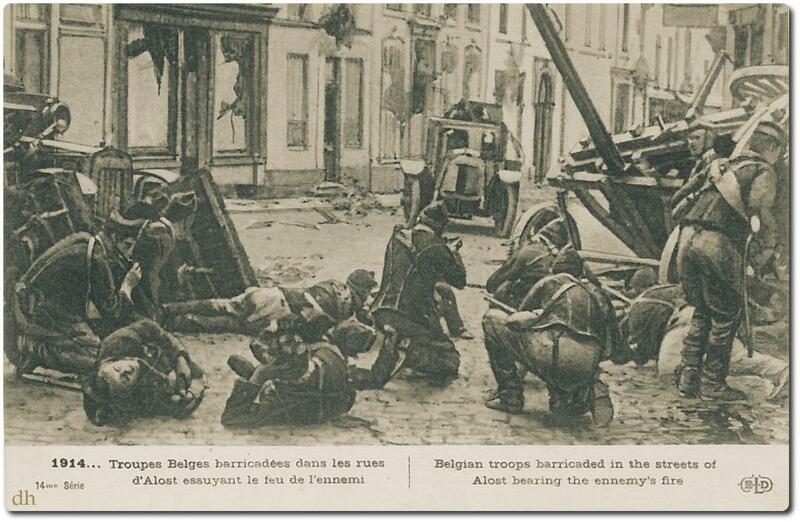 To read and download Weigle's book My Experiences on the Belgian Battlefields (1914) click this link. Available on Kindle - "American Cinematographers in the Great War"
Last October, when authors Jim Castellan and Ron van Dopperen paid a visit to the Pordenone Silent Film Festival in Italy, our publisher John Libbey mentioned to us that he was considering to have our book American Cinematographers in the Great War made available as an eBook. John was quite busy during the film festival, so we showed our appreciation for his continuing support but we expected it would take some time before an eBook version of this publication would be ready. As it turns out, John struck a deal earlier this year with Amazon, which already has our book in print for sale worldwide, and as a result Amazon from 2016 now also offers a digital Kindle version of American Cinematographers in the Great War. On August 1, 1915, American cinematographer Albert K. Dawson while following the offensive on the Eastern Front with the Austro-Hungarian army produced a fascinating film report on the Russian trench system. "The breastworks are remarkably modern. I have taken some really great pictures of these trenches", Dawson noted that day in his war diary. When Dawson wrote these lines he accompanied the Army Detachment under the command of General Remus von Woyrsch, which was just about to capture the Russian forts around Ivangorod. Dawson's notebook shows how he managed to get himself attached to this army and how he risked his life to cover the offensive. Because of the historical value of Dawson's work as a pioneering camera correspondent his war diary on this military campaign was partially published by the authors in 2011 in an article for Film History magazine. 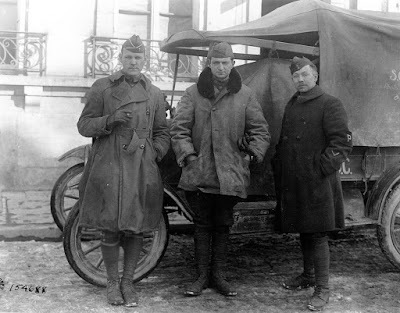 Born in Vincennes, Indiana, in 1885, Albert K. Dawson was one of the most enterprising film correspondents in World War I. His movie report is particularly significant because - although the Russian front in World War I wasn't known to have been heavily fortified - it does indicate that the Russians had in some sectors developed some remarkably elaborate defenses. According to Dawson, the Russians had learned from the war against Japan in 1905 when the enemy used trenches extensively. On my last trip I had occasion to visit and study some of the Russian fortified field positions in Poland. From a military engineer's point of view they were simply beautiful. To take them with a direct frontal attack would require a force a hundred times as large as the defenders and the loss would be very heavy. In fact, I do not see how any number of infantry could break through without the help of artillery. Scientifically constructed barbed wire obstructions present an obstacle which is well-nigh impassable unless one has a good pair of clippers and a lot of time. And behind these obstructions in underground shelters are concealed machine guns which are so placed as to cover with their sweep the entire front. Of course artillery, if you have enough of it and the right kind, will prepare the way for these attacks by blowing these positions up with explosive shells, but that takes very accurate work and costs a lot of time and ammunition. A well placed shell will do a lot of damage but if you miss your mark just a little bit you can shoot all day and do no damage at all. That is one big lesson we must learn, "digging in". Also, in May 1917 Dawson published an article for Scientific American on the Russian trench system, which can be viewed and downloaded here. We uploaded scenes from Dawson's film, showing his visit to the Russian trenches, on our YouTube channel. The Enemy Within - German Sabotage in the U.S.A.
On February 2, 1915, German officer Werner Horn bombed the international railroad bridge in Vancesboro, Maine, in an attempt to sabotage transport of war supplies to Canada. Masterminded by spymaster Franz von Papen, the bombing was the first public act of sabotage by German agents in America during World War I. Arriving on the scene shortly after the explosion, Louis de Rochemont filmed the aftermath of the stirring attack. The sabotage of the Vanceboro Bridge was breaking news in the United States. A number of film crews arrived in town looking for newsreel footage but left with nothing truly usable. However, Louis de Rochemont, a 16 year old freelance cameraman from Massachusetts, was able to capture the story. He reportedly convinced Deputy Sheriff Ross into a reenactment of Horn's arrest and combined it with footage of the damaged bridge into a newsreel that he sold to Hearst-Selig News Pictorial. A 16 mm. print of the historical footage that was shown at the local Vanceboro theater has survived and was made available to the Northeast Historic Film Archives in Bucksport, Maine. Because of its historical value the film was restored by UCLA Film and Television Archive. Deputy Sheriff Ross and Werner Horn pose for de Rochemont's camera. HEARST-SELIG PICTORIAL NO. 12 (Feb.11)  — Testing new fire escape. Man slides down rope from top of Munsey Building, Washington, to street, eleven stories below. Mid-winter Carnival at Saranac Lake, N. Y. Picturesque parade. Twenty children are injured in Orphanage wrecked by wind in New Orleans, La. Grace Darling visits bide-a-wee, home for abandoned animals, in New York City, and has interesting experience. First pictures of Italian earthquake. Avezzano, [shot by Ariel Varges] where 10,000 persons perished, a levelled waste. Maimed and destitute survivors are cared for by militia and volunteer aid corps. Searching for victims. Houses demolished at Yarmouth, England, in daring aerial invasion by Zeppelins. Mounted infantry and motor guards patrol English coast. International bridge across St. Croix River at Vanceboro, Maine, is damaged in dynamite blast. The scoop by de Rochemont is mentioned in Raymond Fielding's classic film history book The American Newsreel. 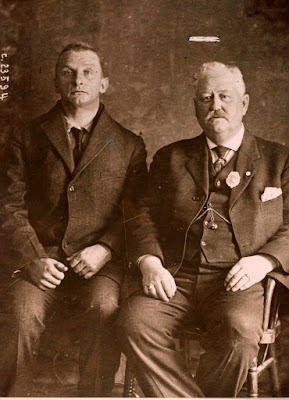 One of the earliest references we could find was in a newspaper story by the [Kansas] Emporia Gazette on October 23, 1937: "De Rochemont persuaded the marshal who had Horn in custody to reenact the arrest. The newsreel company to whom de Rochemont sold the film at first refused to accept it on the ground that it was faked, but the budding cameraman persuaded them that it had been re-enacted just as it had taken place, and they used it." Nicknamed "the father of the docu-drama", de Rochemont in the 1930s created the groundbreaking newsreel series March of Time. His early documentary productions won two Academy Awards. Louis de Rochemont died in Newington, New Hampshire, on December 23, 1978. A reconstruction of the making of de Rochemont's World War I film has been uploaded on our YouTube channel. Walter De Swaef from Belgium recently contacted us about a remarkable World War I silent newsreel that he had discovered on the Internet, showing among other scenes fighting along the Western Front, including combat in Belgium. Based on copyright references that we had found earlier at the Library of Congress, we could identify some of the scenes from this footage, which were culled from Albert K. Dawson's 1915 feature film The Battles of A Nation. 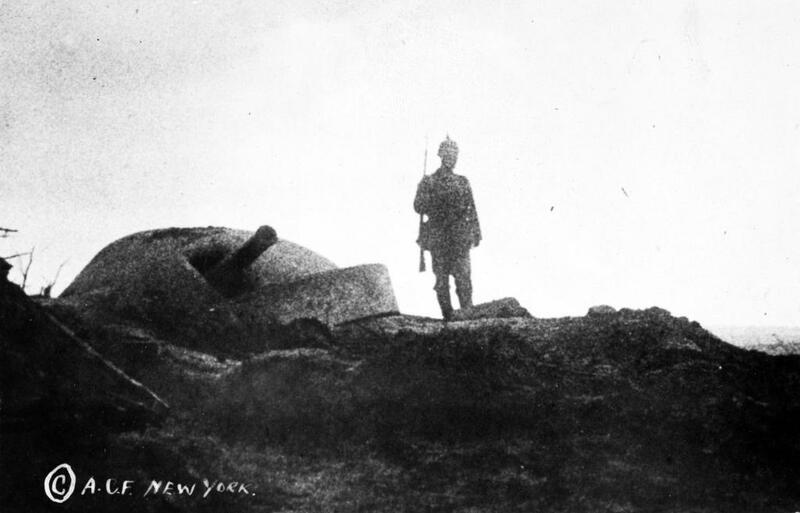 First shown on November 18, 1915, at the Park Theatre in New York City, The Battles of A Nation pictured the attack by the Austro-German Army at the Eastern Front and highlighted the capture of Lemberg (Lvov), the Galician capital, and Warsaw. We had found similar scenes before, both in the nitrate vaults at the Library of Congress, as well as in footage that was used for an Austrian TV documentary on the First World War. But until this discovery we were never quite sure about the actual identity and the original production company. The intertitles in the footage however mention the American Correspondent Film Company (A.C.F) - the film company Dawson worked for - and provide us with some solid proof. As described in more detail in our book American Cinematographers in the Great War, the American Correspondent Film Company was secretly funded by the Germans in 1915 and used as a propaganda tool in the United States. 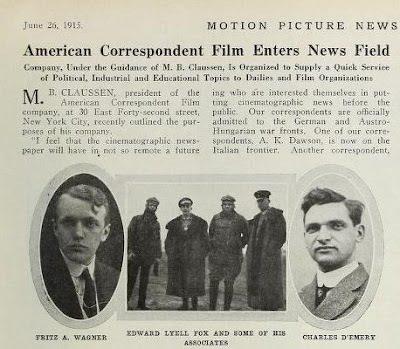 Apart from film shot by Dawson, the company also used films that were supplied by the Zentralstelle für Auslandsdienst, Germany's official foreign propaganda agency in World War I. Here is a synopsis of this film, as listed in the catalogue of the American Film Institute. The footage was uploaded by a stock film library, Periscope, in February 2015 and it is a very messy and no doubt pirated compilation with original World War I footage from a number of sources, including Eclair Films. Apart from the footage that came from Dawson's war film, the film also shows some remarkable scenes taken in 1914, showing the German invasion of Belgium and the resistance by the Belgian army. We contacted Periscope film researcher Nick Spark about the footage, and he said these films were not copied from other archives but come from Periscope's own collection. So, the provenance of this historic World War I movie for the moment remains a mystery, but the authors together with Walter De Swaef are still trying to find out more about this remarkable film. Mr. De Swaef discovered this film while researching his book Duitse Oorlogsgruwel in Aalst. This book deals with the attack and destruction of the Belgian city of Aalst (Alost) in September/October 1914 by the German army, in the process of which 40 Belgian civilians were killed. To view the Periscope film click on this link. We have also uploaded the original The Battles of A Nation scenes from this Periscope footage on our YouTube channel. 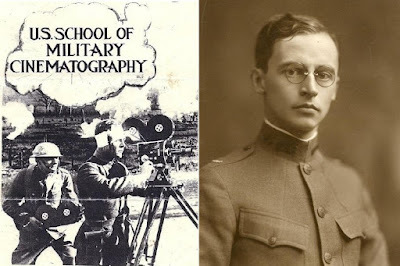 America's first training ground for military cameramen featured in a previous weblog on Carl Gregory and his contribution to the U.S. School of Military Cinematography at Columbia University. Together with Gregory another cinematographer was instrumental in setting up this new school in January 1918 - Arthur H.C. Sintzenich. Surprisingly, he was British. Nicknamed "Snitch", Sintzenich was born in London on August 14, 1884. He is among the best known early cameramen in film history mainly because of his personal diaries that are now at the Library of Congress. From 1913, he recorded his career as a cinematographer in great detail. Nowadays Sintzenich is probably best remembered for his work in the 1920s as a cameraman with director D.W. Griffith. His contribution to the U.S. School of Military Cinematography has remained somewhat underexposed, so this weblog is another attempt to set the record straight and give Sintzenich the credits that he deserves. Sintzenich became a motion picture cameraman in 1909 and his first job in England was with Kinemacolor, the first succesful color system introduced by Charles Urban. Filming his way around the world in the West Indies and Canada, Sintzenich in 1914 went to Africa to capture a safari on film. He then became a newsreel and studio cameraman for Universal in the United States and in 1916 went to the Bahamas to film underwater footage for the movie The Submarine Eye. This experience no doubt also helped him to film the world famous stunt artist Harry Houdini during one of his escape performances. 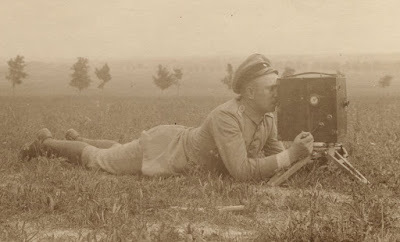 When America entered the Great War in 1917 Sintzenich applied for a commission as cameraman in the U.S. Signal Corps. He entered the Signal Corps as a master signal electrician in December 1917. The entry of his diary for January 2, 1918, mentions: "Took Carl Gregory up and introduced him to the Captain with the result [that] he was requested [to] apply for a commission right away." Just two days later at Columbia University Sintzenich and Gregory for the first time went over the blue prints for the new facilities that were required for the U.S. School of Military Cinematography. During the next days Sintzenich worked hard on interviewing many applicants for the job of photographic instructor. The entry for January 9, 1918, says: "Made up a final curriculum of instruction with Gregory." Sintzenich also drew up the final plan for the film lab at the campus. 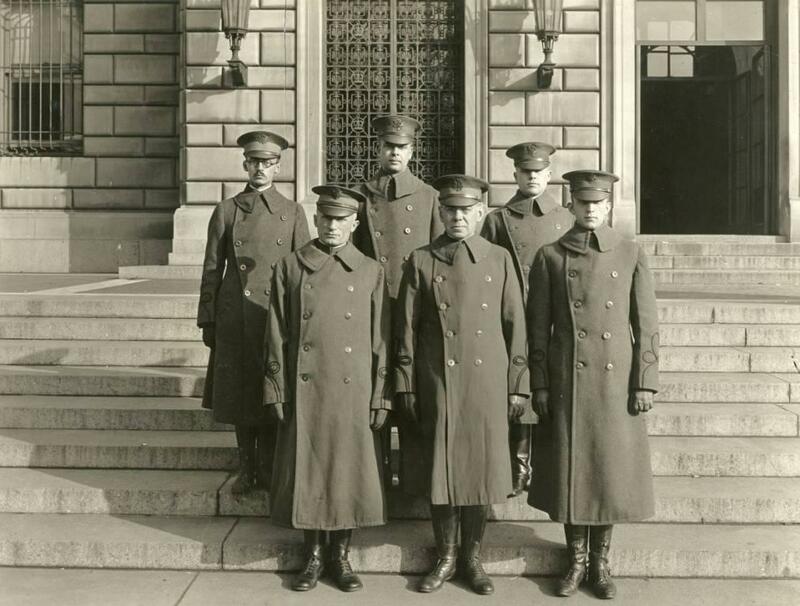 Meanwhile Gregory returned from Washington, D.C. on January 17, 1918, with the news that he had been commissioned second Lieutenant and was made "Production Expert" for the new school. The two men worked on the outside plans of the film lab the very same day. The diary clearly demonstrates that the U.S. School of Military Cinematography was a co-production by the two men, although Sintzenich seems to have done most of the work during the first formative weeks in January 1918. Sintzenich's work stopped suddenly when he was ordered to report in Washington, D.C. for special work. He was called to make movies for the Committee on Public Information, America's wartime propaganda agency, but Sintzenich turned the offer down when he found out he could only do this work as a civilian because of his British nationality. In February 1918, Sintzenich had finished all of his preparations. Two new labs were ready, new camera equipment had been ordered and he had built up a complete staff of instructors who would teach the recruits how to film and photograph America's entry into World War I. Among the new instructors was Victor Fleming, who would later be President Wilson's official photographer during his first visit to Europe. Fleming after the war became one of America's top film directors. Sintzenich noted on February 16, 1918: "Vic Fleming, cameraman for Douglas Fairbanks, has been put in charge of the movie men, temporarily. An awfully good fellow." Wednesday - April 24, 1918: Our usual routine again today. Drills and classes at semaphore. The Motion Picture Office Quarters are moved from the Library to the Havemeyer Hall. The unit carrying over the equipment, etc. In the afternoon I gave them a lecture on camera construction, explaining parts etc, then out for a "hike". 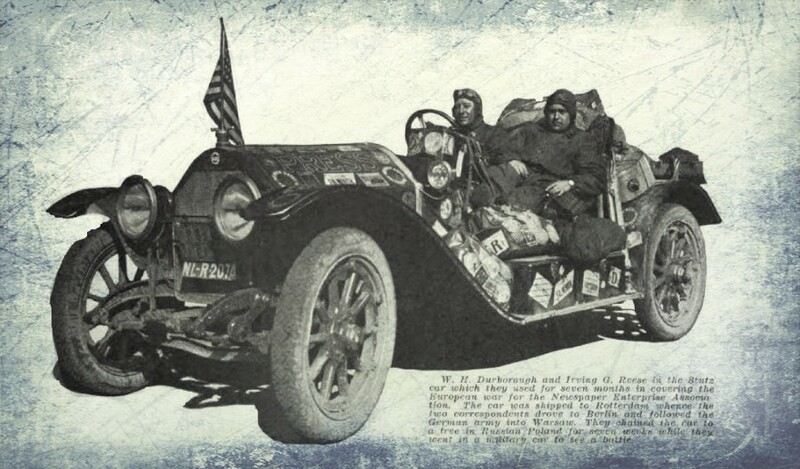 In May 1918, Sintzenich was taken to City Hall and came back an American citizen. He boarded the SS Leviathan in August 1918 and went over to France. If he expected to see any action he was soon disappointed . Most of his photographic work consisted of making identification snapshots of American soldiers. From September 1918 until the Armistice he spent his work for the U.S. Signal Corps photographing American camps, airfields and hospitals in England. "Hal Sintzenich, a camera friend of mine, comes here every day and works with me in the hope that we can make some stuff we can sell. He has not been able to get anything to do since he came back and so we have been working as best we can without capital to try and make something with what I have here. We are building a [motion picture] machine for trick work ... We started building the machine two weeks ago yesterday and estimate that we have it about half finished. Of course we can't do any work with it to bring in any money. We start to work on it about 9.00 every morning and work until nearly midnight." Sintzenich died in Charleston, South Carolina, in August 1974. Information from Sintzenich Diaries courtesy Cooper C. Graham. With special thanks also to Charles "Buckey" Grimm for providing us with some family letters by Carl Gregory. In January 1918, America's first school of Military Cinematography started at Columbia University in New York. 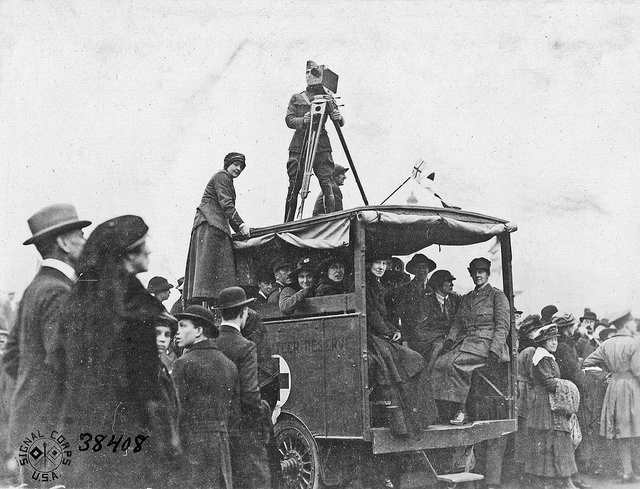 Still photographers and motion picture cameramen were trained for the U.S. Signal Corps that had been assigned to record America's involvement in the First World War. 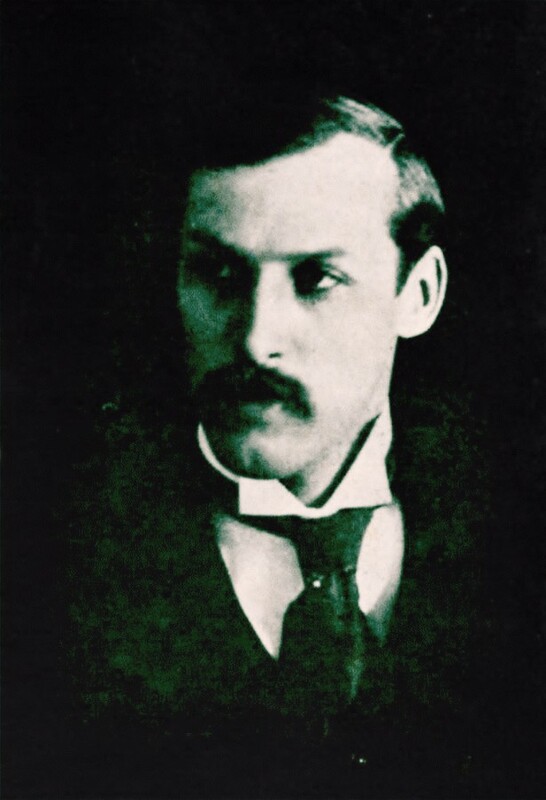 A key role in setting up this school was played by pioneering cinematographer Carl Louis Gregory. 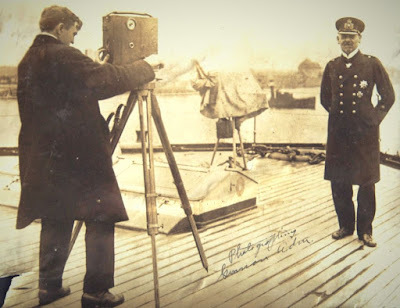 Gregory's name is listed as chief instructor in motion picture photography in a 1918 booklet on the U.S. School of Military Cinematography, that was kindly supplied to us by Buckey Grimm. A copy of this historical document can be read and downloaded here. Commissioned as a 2nd Lieutenant, Gregory took charge of all lessons in military photography for the students at Columbia University. He worked closely on this with a British cinematographer Arthur H.C. Sintzenich - we will discuss his involvement in this project in an upcoming weblog. Another instructor in motion picture photography at this school was Victor Fleming, the well-known future director of Gone with the Wind. When Gregory entered Columbia University he had already earned himself a reputation as one of the foremost cinematographers in the American film industry. Born in Walnut, Kansas, in 1882, Gregory opened his first photography studio in 1905. In 1908 he transferred to the U.S. Reclamation Service where he was in charge of filing and classifying negatives, prints and lantern slides. It was here that Gregory had his first real experiences with making movies. In 1909 he joined the Edison Company as a cameraman and director. A year later he joined the Thanhouser Company and became the studio's chief cameraman. During the First World War Gregory was cinematographer for the Williamson brothers when they shot their groundbreaking underwater films in the West Indies. Gregory in 1916 worked with Sintzenich on a similar project, shooting underwater footage. 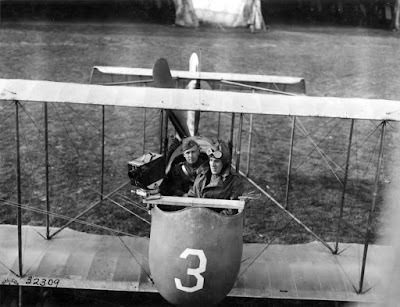 Both would meet again when they set up the U.S. School of Military Cinematography at Columbia University in January 1918. ".. After they had been taught the preliminary operations of setting-up, threading, cranking, tilting and panoraming, they were first permitted to take short sample scenes of familiar subjects about the University, and then after having demonstrated their ability to handle the camera, they were given definite assignments to obtain certain kinds of pictures, at events which were happening in the city or of various activities in the near-by camps." "I am in charge of all photographic instruction ... So far I have had over two hundred students nearly half of whom have been sent away to go across to France with a class of twenty ready and waiting for orders to go. My hours are long but the work is pleasant for the boys are interested in their work and eager to learn and the University is probably as pleasant a place to work as any place that one could find in the city. The hours are 8 A.M. to 6 P.M. and every 6th day I am officer of the day when I have to be on duty from 5.45 A.M. to 9.00 P.M."
Gregory after the First World War was named Dean of Photography at the New York Institute of Photography. He still kept his hand in the business, directing and photographing movies, as well as publishing books on motion picture photography. In the 1940s he worked for the Library of Congress and was the first person to restore an historic collection of early films on paper prints. Gregory was working as Motion Picture Engineer at the National Archives at the time, and he had just designed and built an Optical Printer for shrunken and damaged film. They took the material to the Archives and Gregory modified the Optical Printer and was able to successfully copy the material. Some of this material was used for the RKO Pathé "Flicker Flashbacks" Series back in the mid 1940s. Thus a precious collection of early American cinema was saved and restored on film. Carl Gregory died in 1951 at his home in Van Nuys, California. More information on Gregory's fascinating life and work can be found in the article Life through a Lens by Charles "Buckey" Grimm for Film History journal (2001). With special thanks to Charles "Buckey" Grimm for his input on this weblog.